If the shadow he cast seemed impossibly persistent, so did our morbid desire to understand the reasons linger in the periphery. Did he kill these young men because he was a mere beast, or was he driven by a fascination that stemmed from childhood traumas, as was usually the key component? Criminologist and field experts remain at odds on the triggering point of his psychotic spree: whether it began in the halls of a high school that saw him as an odd duck, or a home life where feuding parents were destined to alienate their sons in a bitter divorce. Maybe something was troubling young Jeffrey long before then, and “My Friend Dahmer,” about those final months leading to his first murder, attempts to centralize those wonders. It is clear from the testimonies of loved ones that he was loved and admired as a son, but was he, just possibly, surrounded by adults who mistook his strange interests as nothing more than offbeat hobbies in between high school courses? 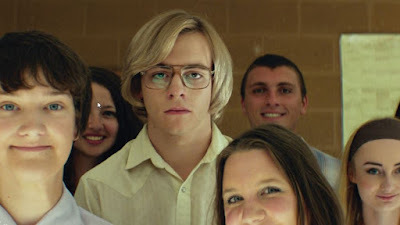 Young Dahmer is portrayed here by Ross Lynch, an actor of family television comedies who rises from obscurity and embodies this persona with a deeply motivated concentration. Beyond a plausible simulation of physical quirks and behavior characteristics, the portrayal focuses on the perception of Jeffrey as a loner who comes to see his eccentric demeanor as a vehicle for attention. An early scene in the halls of his high school reflects this notion; after almost unconsciously moving through classrooms with barely a notice, he staggers into an act of convulsion that observers see as strangely humorous (if flamboyant and nonsensical). A gathering of amused schoolboys push the prospect further – sensing that Jeff would do anything on a dare, his antics become a tool they freely exploit in the cafeteria, on school grounds and even at the local mall (the term “doing a Dahmer” becomes something of a running joke). Because Jeff is, by that point, mostly a loner, he basks enthusiastically in the camaraderie of these new friends; in his mind, any attention at all is a good thing, regardless of the ulterior motives. What others don’t see, however, is a strange routine of activities occurring at home, where young Jeff quietly passes the time by collecting dead animals (mostly roadkill) and taking them into a shed behind his house, where he dissolves the tissue in chemicals in order to harvest their bones. The chemicals, we learn, are supplied by a father who is an aspiring scientist, although his concern over their usage doesn’t come until long after a perversion has settled in. He assumes, perhaps, that his son uses them for occasional experiments in animal biology; later, after he has wandered into the shed to see a sizeable collection of remains, he detects the unhealthy obsession. “I am tearing this shed down,” he informs his son. But Jeff’s urges are not stifled by the lack of a laboratory, and before long there is a scene where he contemplates slicing the neck of a dog he has chained out in the wilderness (“I want to see what your insides look like,” he muses to the animal). In real life Dahmer probably showed little restraint in acting on these thoughts, but the film is filled with such riveting tension that it mixes its gloom with a sense of dogged hope, as if suspicious that there was still time to undo the damage slowly eroding his fragile psyche. Perhaps in that moment of time, there existed such a possibility. Consider a scene where Dahmer stalks the movements of a male jogger from behind a series of trees. The first time he is simply observes, almost seductively; later, after mapping out his prey’s route, he returns to the same spot carrying a baseball bat. What are his intentions? In a police interview years later, Dahmer saw his stalking of the nameless jogger as the moment where his disturbing interest in the human body united with his emerging homosexual feelings, and had the jogger shown up that day, he probably would have been bludgeoned and then used for sexual arousal. But was he destined to murder a living human at that moment, or was his initial apprehension suggestive of a conscience that still had not accepted its dark fate? Could anyone have reached him in time? The conventional wisdom is that all monsters do not begin as such but are taken there through the radical erosion of their mental and sensory stability. Much of the material is observed from the perspective of one of Dahmer’s teenage friends: John Backderf, played by Alex Wolff, whose memoirs inspired the framework of this cinematic interpretation. He sees his subject as an outsider only because Jeff preferred it that way; of the group of teenagers who saw themselves as fans of his bizarre exploits, he seems to be the lone figure consciously aware of a mental deterioration occurring beneath the surface. The catalyst, he suspects, was the sudden divorce of his parents, who are seen in the film as moving towards a split because of constant arguments and alcohol abuse. Then, just as a separation is announced, Dahmer withdraws from the group and becomes a depressed mute, frequently showing up to class in a state of inebriation. Others observe the change of behavior but do not care to contemplate its affect on him – other than Derf, that is, who offers empathetic gestures late in the movie when he realizes Dahmer’s pranks are not in the service of Dahmer, but are tests from teenagers whose friendships are masked with an underlying cruelty. Nothing about this premise nor this journey is unique. 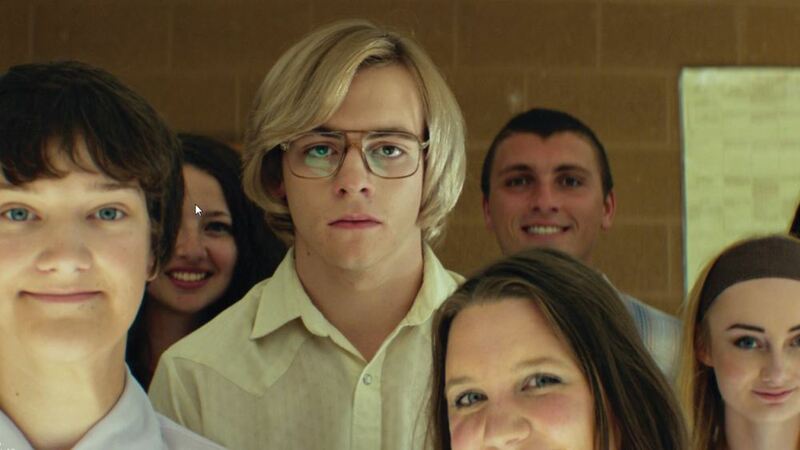 Whether we approach the film as a straight character study or as an insight into the twisted mind of a young villain, “My Friend Dahmer” always plays right into the formula. But the film works above standard because there is a powerful sadness motivating the characters, with no indication that there may be a predisposed judgment going on behind the direction. 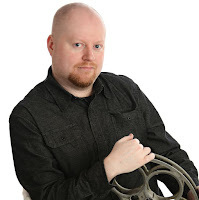 In this moment in time, Jeff is not a serial killer at all – just a quiet, timid, awkward teenager who has mixed feelings about who he is, lacks guidance, and is easily swayed by unhealthy obsessions. History would conclude it was those same impulses that led him down those dark roads, of course, but an evil deed is rarely created in a vacuum. If he continues to fascinate us, it’s because his eventual transformation lacked the conventional signals. The final scene, which could have been overzealous, strikes the perfect chord – caught between the boy that was and the monster that was beginning to emerge, Dahmer is seen picking up the hitchhiker that was destined to be his first human kill. What a strange, frightening man he was. And how horrible it must have been to sense those possibilities, yet be so powerless to stop them from occurring.